Looking to learn about fly tying or want to spend time tying with others? 2628 Constitution Avenue (near Swift Road). Ask Craig Smothers for more details. To reach Craig, call (941) 266-5209 or email him. I’ve been busy tying for Tarpon lately. Here are some Toad’s tyed with PolyPro Floating yarn and marabou on Owner AKI #2/0 hooks. I got a phone call from a fellow fly tier the other day. He had added a solvent to his fly tying glues and it had curdled. I had told him to use one solvent, he used what he had. There are a huge number of different glues available on the market for fly fisherman today. Some will be gone tomorrow. I have a core group of these which I personally use and recommend. Each of these has a different base solvent. I will be covering all of the different types of glues I use, for what purpose, and what they can be thinned with. First of all “tying cement” and “head cement” are not the same animal. Being a saltwater tier, I used different glues to “tie” and “finish” my flies. This is where all tiers have preferences. I have mine and will defend them. Dave’s Fleximent is great “tying” cement. If this stuff is kept water-thin and used throughout the tying process, you almost don’t need to whip finish. Fleximent is simply Household Goop (in the toothpaste tube) thinned with either Toluene or Xylene (Xylene is less toxic). If you have used Softex, it’s just a thicker version of Fleximent and uses the same solvent. Put a big toothbrush’s worth of Goop in a glue jar, add enough solvent to cover it plus a bit, and let it sit overnight. Thin the glue until it just holds onto the bodkin. A tube of Goop and a can of solvent and you’re set for a lifetime. This class of cements, both solvent and water based, includes everything put on top of the thread to finish the fly. One of the standards here is Sally Hansen’s Hard as Nails (thins with Acetone). Loon Hard Head water based polyester fly finish is another friendlier product (be sure and shake the wiz out of it). That one thins best with Denatured Alcohol or Vodka as odd as it sounds. Epoxies are also included in “head” cements. I use a great deal of Flexcoat Rod Wrap Epoxy. This takes two hours to set and requires the use of a fly turner (modified BBQ rotisserie) to get a smooth professional finish. If that’s too thin (feather collared on Tarpon flies) use Flexcoat Rod Building Epoxy. That sets in 20 minutes and has a thicker body. Five-Minute Epoxy has a place on every fly tiers bench. I don’t like it much as it yellows quickly. The longer the epoxy set time, the less yellowing over time. To thin Epoxy, use a drop or two of either acetone or alcohol. Liquid Fusion urethane glue is a one part epoxy substitute. Being thicker and water based makes it friendly, but it still has a two hour set time. This one is thinned with alcohol which also increases the set time. The new kid on the block is the UV Light Cure Epoxies. They come in thick, thin, and flexible (like silicone). Brush them on, hit them with a UV flashlight of the correct spectrum for 30 seconds and it’s set for good. It doesn’t yellow. There is a residue from the curing process which can be wiped off with a soft cloth and alcohol. Nail Salons have been using (clear and colored) UV nail gels as long as fly tiers. Same stuff. Dentists have been using a similar material for decades (not clear and a different UV frequency). I’ve made M.O.E.’s bonefish flies out of that. The most important glue I haven’t covered is Cyanoacrylate (Crazy or Super) glue. There are many different manufacturers of this, both thin and “fill in the gaps”. Zap A Gap Thick comes to mind. The newer glues with the brush tops should be on everyone’s bench. This dries a bit slower and doesn’t crystalize in the tubes like many in the past. If you use mono tying thread, absolutely use this in lieu of Fleximent. 3D eyes won’t stick on their own. Fletch-Tite glue (for fletching arrows) is just right. It has a long nozzle to work it down into the materials, thick syrupy consistency, and dries in 20 minutes-fish it in an hour. Ever heard of someone losing all the guides on their rod when a Tarpon or Tuna takes off? The transition between the fly line and the backing is the cause. To smooth the transition over the knots, try using Pliobond. Pliobond is similar to the rubber cement you had as a kid. Building layers of this glue in the shape of an elongated football over your knots will save your guides from extraction. It remains flexible and crack free. 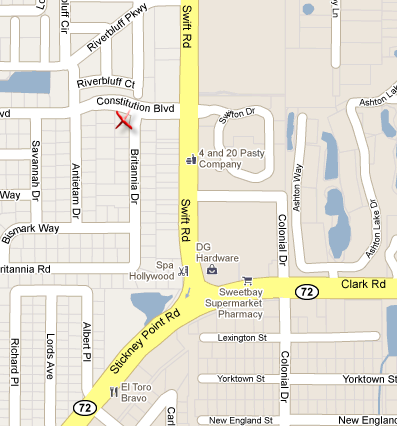 Find a local Compounding Pharmacy and purchase several dropper bottles (plastic works but glass is better). Get a bottle for each solvent and label them. I keep one of each: Xylene or Toluene, Denatured Alcohol or Vodka, Acetone, and Lacquer Thinner (I still paint my lead eyes with Wapsi Lacquer paint). Using a dropper in any case is a smart way to control the amount of solvent you add to your glue/paint. These solvents are dangerous, flammable, and can be toxic. Use some common sense. One last thing. Have you ever gotten your fingers all covered in silicone? I’ve built a number of aquariums in my time and silicone gets everywhere. Kodak has a solution never designed for it, but the silicone won’t stick to you. It’s called Photo-Flo 200 Solution. Wash your hands well and dry. Slick your fingers up with Photo-Flo. Nothing will stick to you. It makes working silicone into the sides of a 3D ultrahair fly a breeze. Please note that I am not saying I don’t like any manufacturers’ product. There are an abundance of products I have not used. I am speaking only to the ones I do use. There are quite a few time I find that I need to make mono eyes for a fly pattern. These shrimp and crab patterns tend to put me off because it’s a pain to produce mass amounts of mono eyes in a timely fashion. Several manufactures’ sell these eyes, but they are pricey. The eyes I am speaking of are eye stalks, not the mono bar-bell eyes (like mono bead chain). Here are a few tips to help expedite making your own. Burning mono eye stalks is one way to do this. First, choose your monofilament. I recommend a stiff mono such as Ande or Mason in #20 to #30. Not Fluorocarbon. Using a Bic lighter is not the way to do it; half of the time you just start the mono on fire, or burn yourself. Find a votive candle to act as a consistent flame. Be sure and work over a surface which you can drip hot mono over, not your lap. Dip the mono in and out of the blue portion of the flame trying not to catch it on fire. Quickly tip the mono in a down position in order for the burnt end to remain parallel with the mono. If you hold it sideways, the burnt end tends to bend over. Allow it to cool for a few seconds, and set it aside. Once you have built a few, dab the end with a black permanent marker. Another way to produce eyes is cheat. Stop by the local craft store and purchase small (#10/0, #11/0, #13/0) black glass seed beads. String a bunch on a length of mono. Heat the end of the mono in the flame, then mash the tip on a smooth surface (looks like a golf tee). Slide a bead up while it’s warm, or brush the end with brushable Crazy Glue. Clip it off and move on. Do not clip mono with your fly tying scissors! Get a small pair of wire cutters for that job! When attaching them to the fly, pinch the tie in point flat with (Chain Nosed) smooth jawed pliers to keep the mono from rolling on the hook shank as you tie it in. 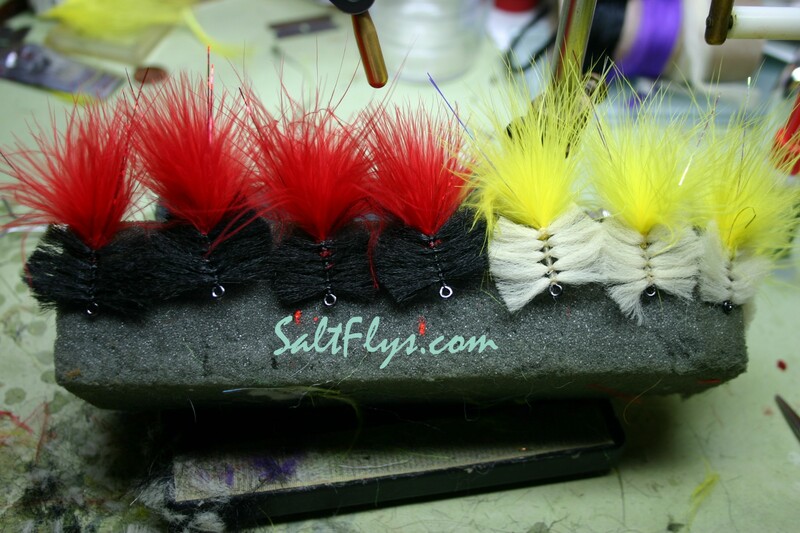 Want your flies to stand out? Dip the ends of your eyes in a long set epoxy and turn them on a drying wheel. This enlarges them slightly and really makes them look great. Want more bling? I stopped by an automotive paint store and purchased a small container of red pearl powder (cheap). This is the stuff they mix into the clear coat of many cars that gives it a glow in the light, often a different color from the base color. Add a very small amount to the epoxy to give a red glow under dock lights or sunlight, much like shining shrimp with a flashlight at night. 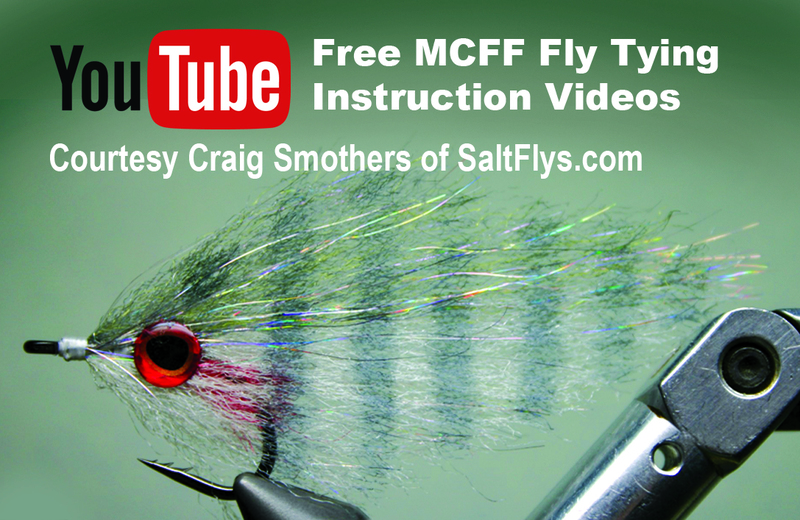 Bring an effective and realistic bling to your fly patterns. Build your own mono eyes. After my Enrico fiber primer last month, I thought I would follow up with some observation on the use of rabbit fur for Tarpon flies. Rabbit fur is about as easy to work with as any other material. Tarpon flies tyed from it are quick and impossible to screw up. 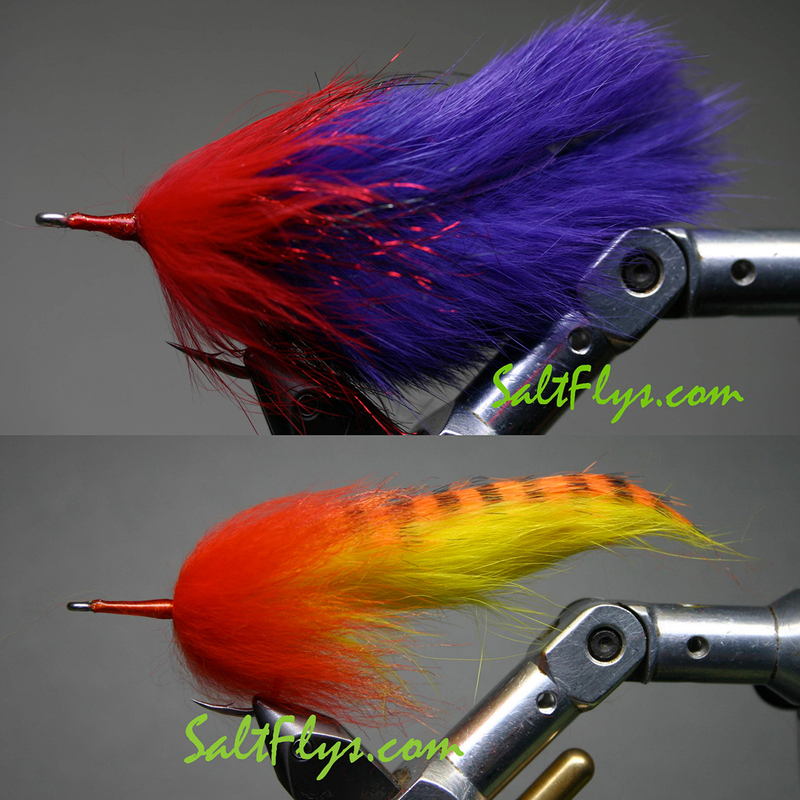 Rabbit sinks well, comes in a myriad of colors, and adds a great deal of movement without ever striping the fly. A traditional rabbit tarpon fly consists of a zonker strip tail, and a cross-cut strip palmered around the hook for the body. Zonker strips are cut along the length of the body; cross-cut strips are cut across the body. There are two width grades of zonker strips, most are a 1/8” wide, and magnum strips are ¼” wide. I would recommend the wider strips for the tail. Cross-cut strips are typically cut 1/8” wide, which work well for palmering. Watch how thick the leather is on cross-cuts. If it gets thick, it can be difficult to palmer. The thickness of the leather on zonker strips is unimportant, thicker is fine. The color of the fly is a matter of what time of day it is, and personal choice (oh, and what the tarpon feels like eating in the morning). There are rabbit strips in many different color choices, including a bar dying process, and a triple dying process, to further increase the (confusion) number of choices. Given a choice, you can’t go wrong buying black/purple, and black/red, or purple/purple, especially for early in the morning. Bar dyed strips give the illusion of movement much like grizzly feathers do, always a good thing. Hook choice for tarpon flies is always debatable. I use Gamakatsu SC-15 2H in size 3/0. The shank of this hook is slightly longer than most of the other hook brands and types. It suits my tying. It’s 2X strong, small barbed, and damn sharp. I like Owner Flyliners as well, but they’re quite pricey. Thread choice is simple: Flymaster + 3/0 to build the fly, Flymaster gold 6/0 to build the head (eye). Flymaster + has the strength to really wrap down the rabbit hide to the hook. Unfortunately, building up the head of the fly with such large thread makes it difficult to get a smooth looking head. I drop back to the thinner 6/0 after the fly is tyed to build the head. A mono loop must be tyed at the back of the hook to prevent the tail from fouling around the hook. It must be a stiff mono with a break strength of 20#-40#. Mason is perfect for this. Use a pair of pliers to mash the ends of the mono flat for better strength at the tye in point. Form a loop extending ½” behind the hook right on top. Tye the tail in right on top of the mono loop. Glue that stage down to the hook with Crazy Glue (brushable) so it won’t twist around the hook. The next step is to tye in the collar. This will be cross-cut hair. Make sure the hair is pointing toward the back of the hook. Attach it right in on top of the tails’ tye in point. Gluing the thread with Fleximent before wrapping the hook will also add to the fly’s strength. Palmering the hair over the hook and away from you, make three to four wrap around the hook. Wrap the thread over the collar tightly. Trim the excess rabbit strip and give the collar a few more tight wraps. Whip finish the thread and glue the head with Fleximent. Now tye in the Flymaster 6/0 thread and build a nice smooth head. Whip finish the thread and reglue with Fleximent. Top coating the thread can be done with epoxy, or my new favorite, Sally Hansen’s Mega Shine fingernail polish (in the chrome bottle at CVS or Wal-Mart). Last Year I was building the traditional “Tarpon Bunny” flies. This year I’ve taken the traditional and kicked it up a notch. Enrico’s tarpon flies are all primarily deceiver-like. I join Enrico’s vision, but again using a non-synthetic rabbit fur which is easy to handle and dead-simple to tie with. Captain John Hand brought up the subject of the proper hook for tarpon flies at the last meeting. I’d like to follow up on this and talk about all the different hooks that are available and which ones I use. Everyone knows that even in perfect situation where the tarpon eats the fly, buttoning her up isn’t an easy chore. That perfect pattern on that perfect piece of metal wire just doesn’t penetrate that titanium plated mouth. The hooks have changed a great deal to help expedite that hook-set, but odds are still in favor of the fish. The Partridge Homosassa Special is the first hook I can remember which was designed to fly fish for tarpon. It was heavy wire with a perfect bend and was a great choice for tying flies on (no longer available, sorry). Another oldie but goodie was the Eagle Claw 245SS (still available). This one is constructed of stainless steel and has a short shank and will still work for tarpon, but there are much better choices. The 254SS has a large barb I don’t care for. One of the trends in fishing hooks is a small barb. These take less energy to drive home. Barbs were originally designed to hold bail on, not fish. Captain Hand mentioned Owner hooks. Some find the point on these to be too delicate. 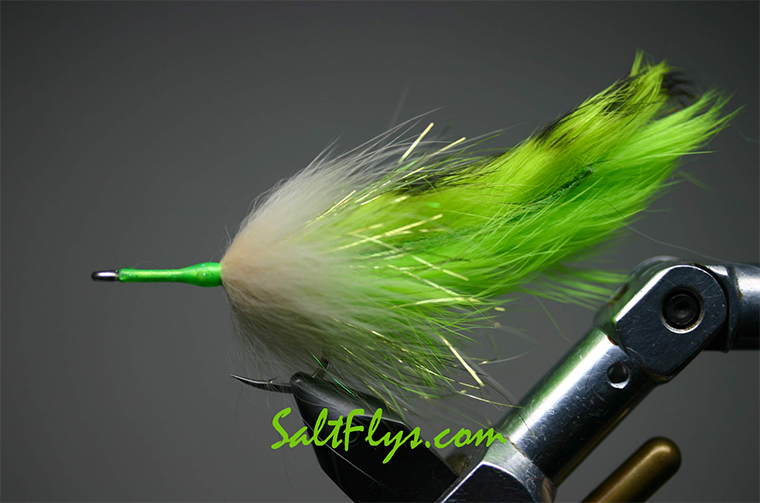 These are still my personal choice for my tarpon flies. The two choices for fly fishing are the Flyliner and the AKI. The difference I see between them is the length of the shank and the size of the wire. Both are great hooks with knife points and small barbs, but are expensive. The Tiemco TMC800S is another of the hooks which has been around for a while. It has a small barb, very sharp out of the box and is forged. Tiemco also build a hook with a knife point like the Owner hooks. The TMC600SP has a knife point, small barb, has slightly finer wire than the Owners’, and was designed with tarpon in mind. Prices on both of these hooks are high. There are several Gamakatsu hooks which work for tarpon flies. The most common offering is the SC15-2H. This is the hook which I tie most of my tarpon flies on. It is relatively inexpensive, is heavy wire, small barb, and works well. Gamakatsu came out with the SC17 a couple years ago which was designed for tarpon. Also a great hook. Lastly, the SL11-3H is the only hook offering I’ve talked about which has a longer shank. This is another great hook at a reasonable price. Mustad offers only one hook which I would consider for tarpon flies. The C70SD is one of their Signature line of hooks (needle point). It is a heavy wire and has a large eye for those heavier tipits. I don’t find them quite as sharp as any of the others right out of the box, but a good relatively inexpensive hook. One last thing about tarpon hooks. There are two basic schools of thought on the bend of the hook. There is the perfect bend: the point of the hook remains parallel to the hook shank. There are several forms of inset bends: the bend of the hook creates has the point slightly inward towards the shank. The basic argument is about the geometry created when the hook is attached to the fly line and the fish has eaten it. Which geometry works better? I’m afraid that I’ll have to defer the answer to Captains Pete Greenan (inward bend) and Bryon Chamberlain (perfect bend). One additional note to my original article. Flies used for catching tarpon in this area have been getting smaller over the years. If you are using a smaller hook for your flies, I have a new favorite. VMC is a french company which produces the 7106BN #1/0 hook. This hook was made for the carp fishermen in Europe. It is a black nickel plated, heavy wire, short shank, hook with a triple micro barb. It is just outstanding! I wish they made them in larger sizes (up to#3/0). They are nearly impossible to find in the USA, but I carry them at SaltFlys.com.